Hosted by the University of Vermont Extension Northwest Crops and Soils Program, as part of their Drainage and Doughnuts Webinar Series. Effective November 23, 2018, Required Agricultural Practices amended to include language addressing nutrient contributions from subsurface tile drainage. 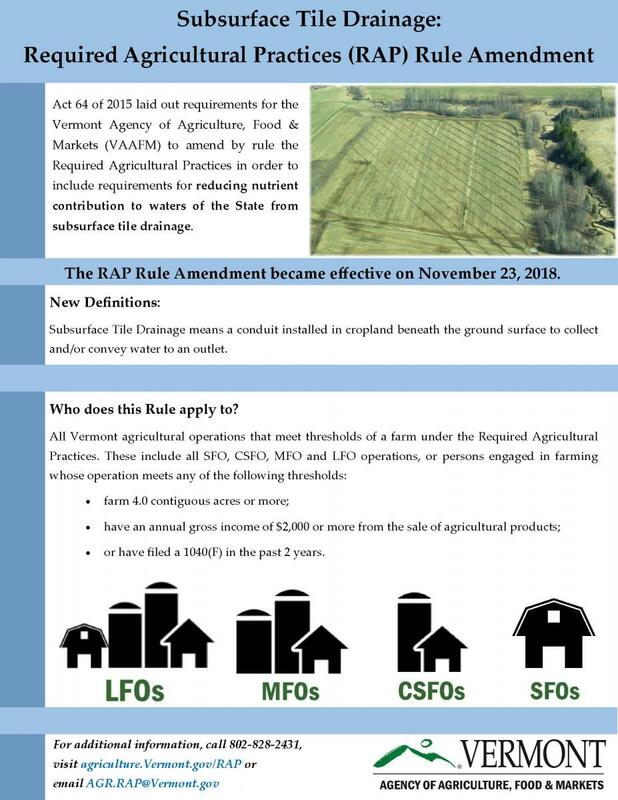 November 14, 2018 / Montpelier, VT - On Thursday, November 8, 2018, the Vermont Agency of Agriculture, Food & Markets (VAAFM) filed the adopted rule amendment to the Required Agricultural Practices (RAPs) with the Legislative Committee on Administrative Rules (LCAR) and the Secretary of State (SOS). The amendment includes requirements for reducing nutrient contribution to waters of the State from subsurface tile drainage on agricultural fields. Subsurface tile drainage removes excess water from agricultural soils below the surface, usually through a system of plastic piping. For more information on agricultural subsurface tile drainage, please see the Vermont Subsurface Agricultural Tile Drain Report prepared by VAAFM and the Vermont Agency of Natural Resources (Click Here for Report). The rule amendment was adopted on November 8, 2018 and will take effect on November 23, 2018. 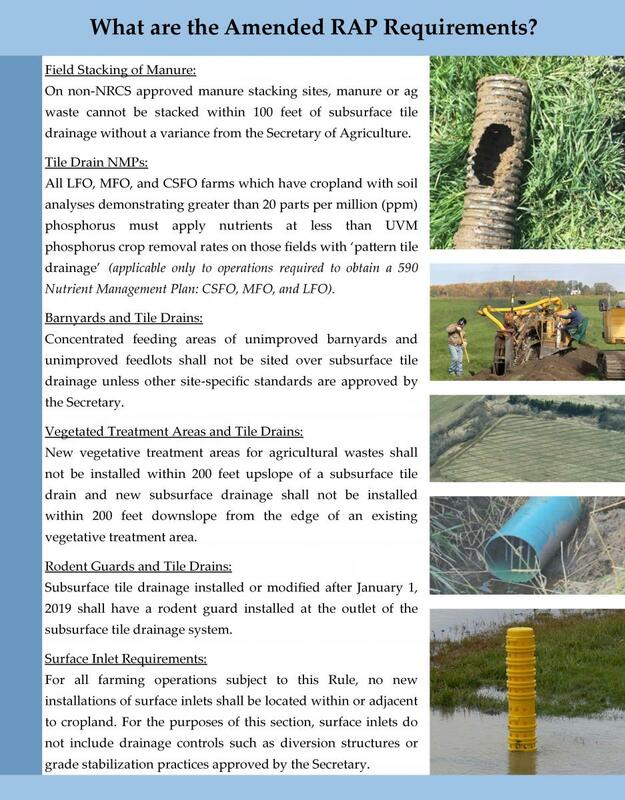 The requirements of the rule amendment include the required installation of rodent guards on subsurface tile drainage outlets installed or modified after January 1, 2019, the prohibition of new installation of surface inlets located within or next to cropland following the effective date of the amendment, and other provisions focused on reducing nutrient losses from subsurface tile drainage. Subsurface Tile Drainage Responsiveness Summary.